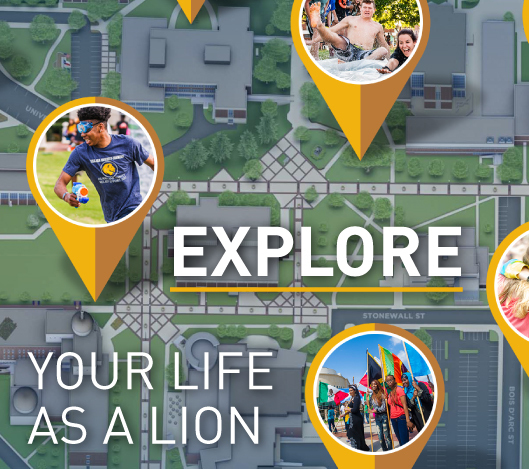 Individuals and families may schedule a campus tour with our Lion Student Ambassadors for a firsthand look at campus. Because our tours are conducted by our great students, our weekday tours start promptly at 10:00 a.m. and 2:00 p.m. Monday- Friday and last about 1 hour. Saturday tours are offered at 10:00 a.m. when the university is open. Advance registration is required. Please make your reservation at least two business days in advance of your visit. A confirmation email will be sent with additional details including directions, parking, and how to contact the academic department of your choice. Note: Your tour has not been scheduled unless you receive an email confirmation. We offer tours before and after campus tours at the following times: 11:15 a.m. and 3:15 p.m. Monday- Friday and only at 11:45 a.m. on Saturdays during the fall and spring semesters. If you have any questions about viewing housing, please contact their offices directly at 903-.886-5797 or you can visit the Residential Living and Learning webpage. If you are a candidate for Honors College, Prairie Crossing is also available to view. While space is limited at Prairie Crossing, we encourage you to arrange your tour in advance with Dr. Ray Green at 903.468.3001 (only for Honors College applicants).